The day after lawmakers ended their legislative session, Gov. 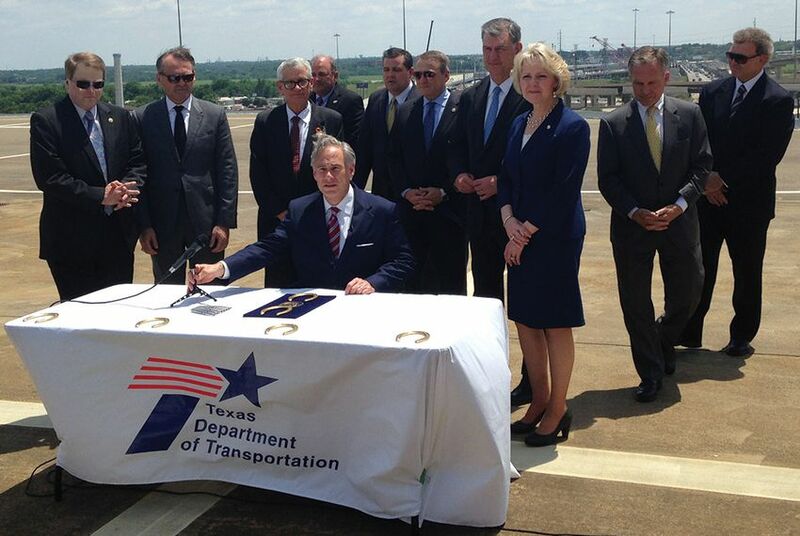 Greg Abbott touted a successful session for transportation funding and issues, as he signed three bills on a heliport in Dallas. On Tuesday, Abbott was at a heliport at the Dallas Convention Center not far from where he shot that commercial as he touted a successful session on transportation. Lawmakers approved several measures during the 84th legislative session to boost transportation funding, including agreeing to ask voters in November to approve amending the state constitution to dedicate $2.5 billion of the general sales tax to the highway fund beginning in 2017 — as well as a portion of future motor vehicle sales taxes beginning in 2019. “The future is brighter, and Texas lives are going to get better” if the ballot measure passes, Abbott said. Budget writers also ended about $1.3 billion in so-called diversions, in which gas tax money was going to pay for items other than road construction and maintenance. “Not only are we dedicating those funds on building roads, but we’re also ending diversions of money that was intended for those roads,” Abbott said. Abbott ceremoniously signed three transportation-related bills Tuesday, including House Bill 20, which aims to bring more transparency to how the Texas Department of Transportation decides which projects to fund. Abbott also signed House Bill 2612, which directs the Texas Department of Transportation to develop a report that includes a plan "to eliminate all toll roads” in which TxDOT contributed money to the construction. Lawmakers have said they hope the report will provide a clear sense of whether eliminating the state’s toll roads is financially feasible. Abbott also designated a segment of U.S. Highway 287 in Midlothian as the Chris Kyle Memorial Highway, in honor of the "American Sniper," by signing House Bill 1187. “We want to ensure that generations from now, people will drive down Chris Kyle Memorial Highway and remember the role that he played in making Texas a better place,” Abbott said. Following the bill signing, a reporter asked Abbott about bills sent to his desk that will allow for some Texans to openly carry handguns and carry them on college campuses. Abbott said he did not share critics’ concerns that the measures would create safety issues. Aman Batheja reported from Austin, and Jim Malewitz reported from Dallas.